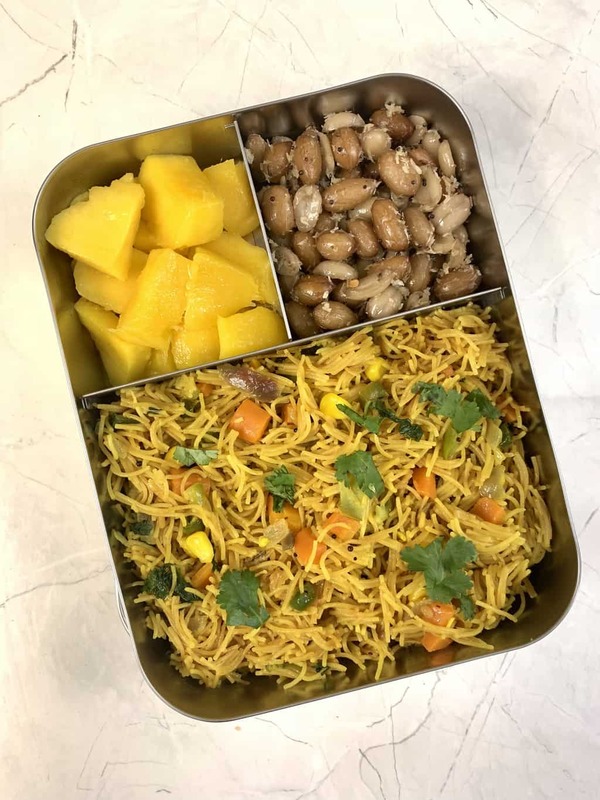 Vermicelli Upma is a Kids friendly recipe.It makes for a good breakfast or a packed lunch box for both kids and adults. The recipe is gluten-free and vegan .Kids love it because they think its kind of pasta or noodles.Vermicelli are made from either rice or wheat.I usually use wheat semiya of either Bambino or MTR Brand.For rice semiya please follow the packet instruction to cook the dish. Vermicelli is known by various local names in India. In Kannada it is known as Shavige, Telugu name for vermicelli is Semiya or sevalu, and Seviyan in North India. LUNCH – Veg Vermicelli Upma – A popular South Indian breakfast dish Vermicelli Upma also known as Semiya Upma. It is a quick and healthy dish that you can cook easily in just 15-20 minutes with simple ingredients. Dry roast Vermicelli in a pan on medium-low flame untill it turns light golden brown.I have used roasted bambino vermicelli for this recipe. In a kadai heat oil ,add mustard seeds ,jeera and wait until it gets splutter. 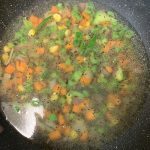 Add urad dal, curry leaves, hing and saute until urad changes into light golden brown. Add chopped onion, green chilies, turmeric powder and cook until onion becomes light brown. Add water, salt and bring it to a boil. Check for the salt at this stage. Add the roasted vermicelli and mix well. Cover lid and cook until the water gets completely absorbed by the vermicelli on medium low flame. Garnish with coriander leaves and lime juice and serve hot. 1. Make sure to use roasted vermicelli, raw vermicelli will become mushy. 2. You can use vegetables of your choice. 3.For kids box you can replace oil with ghee.Makes it more healthier choice. 4.You can also add roasted cashews or peanuts(groundnuts) to make it more healthy and crunchier. SNACK – Peanut Sundal is a South Indian recipe ideal for festivals like Navaratri. Peanuts stir fried with red chilies, grated coconut , curry leaves and few spices, giving it an amazing aroma and flavor. It is a very simple dish that is high in protein and can be make in less than 5 minutes. Soak peanuts for atleast 30 minutes.Pressure cook peanuts with required water and salt for 3 whistles or until soft yet crunchy enough to bite,Keep it aside. Heat oil in a pan ,add the items listed one by one under ‘For Tempering’ let it splutter. Then add peanuts and give a toss until mixed well.Adjust salt if required at this stage.Saute for 1-2 minutes on medium-low flame. Then add grated coconut ,give a quick stir and turn off the gas. 1.Dont boil peanuts till very soft, it should be crunchy when you bite. SNACK – Mango is a seasonal fruit ,i remove the skin and simply chop the fruit into cubes and pack for the box. Chop the vegetables previous evening and refrigerate. You can soak and boil the peanuts (groundnut) previous evening for sundal save’s a lot of time. If you do not have roasted semiya ,you can roast the previous evening to save some time in the morning.